It is time to save the dates again for Durham Creek Week. During Creek Week, Northeast Creek Streamwatch is encouraging volunteers to come out in neighborhood groups just to discover their local stream, explore it, clean it of litter or bulkier items. Northeast Creek also encourages volunteers to explore the wetlands that form the boundaries between many of our neighborhoods. To participate in official Northeast Creek Streamwatch events, contact Colleen Haithcock (colleen@northeastcreek.org) to register. Also visit us at the South Durham Farmers Market during March. To see announcements of events as they are scheduled, “like” Northeast Creek Streamwatch on Facebook. 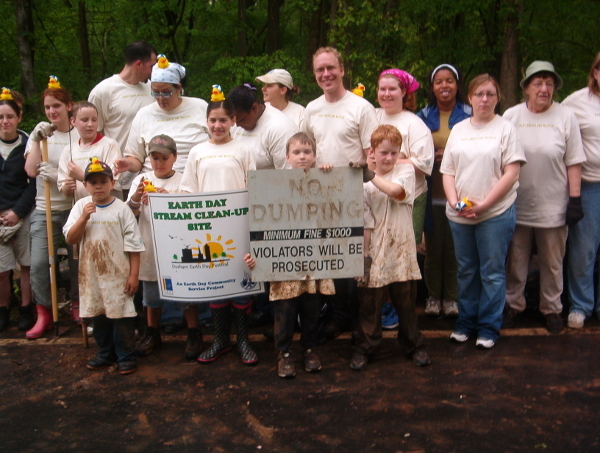 Northeast Creek Streamwatch has been cleaning up locations on the creek since 2006; we have been participating in the Durham Creek Week clean-ups since 2009. Creek Week is a time to discover and clean up our local streams. 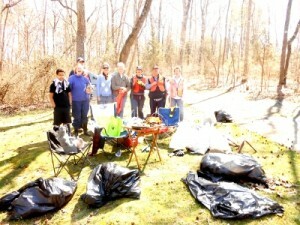 It has been celebrated in Durham since 2009, with 1,937 volunteers collecting 117,270 pounds of litter to date. Durham Creek Week 2017 will have events from March 17 through March 25. Save the dates now for the events that interest you and your family from the list of Durham-wide events.. The Northeast Creek watershed drains the southeastern part of Durham County, the northeastern part of Chatham County and the western part of Wake County. Water from Northeast Creek flows into Lake Jordan at the NC 751 bridge and from there down the Haw River to the Cape Fear River and out to the Atlantic Ocean at Cape Fear, south of Wilmington. 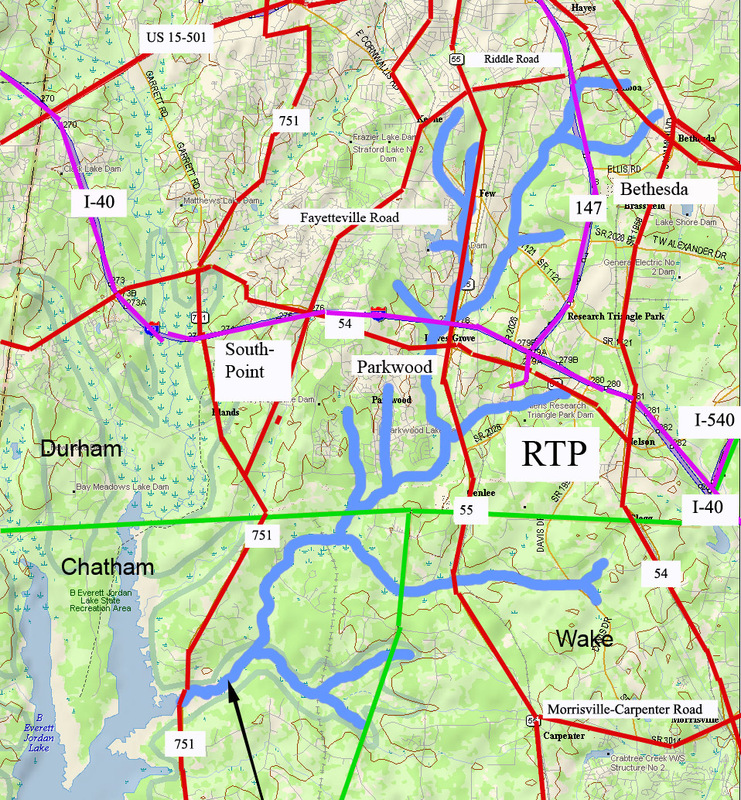 If you live south of Glover Road or Riddle Road in Durham and between Fayetteville Road and Miami Boulevard in Durham County, or east of NC 751 and north of New Hope Church Road in Chatham County, or north of Green Hope Road and west of NC 55 in Wake County, you likely live in the Northeast Creek basin. So find your location in your watershed, gather up some friend, family, neighbors, and co-workers, and schedule a creek clean-up for Durham Creek Week. It’s a great way to welcome spring! 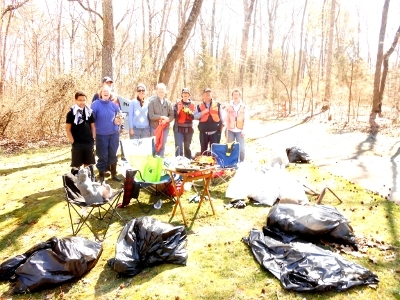 Ten volunteers (eight seen here) in three hours cleaned out six bags of trash on Parkwood Creek between Seaton Road and the Lotus Pond on Clermont. Objects recovered from the creek were a couple of small tires, a well-weathered kickball and small football, a length of twisted guywire, and a bent metal table leg.